Only Administrators and Application Managers can create team projects. Private projects can be created by anyone. 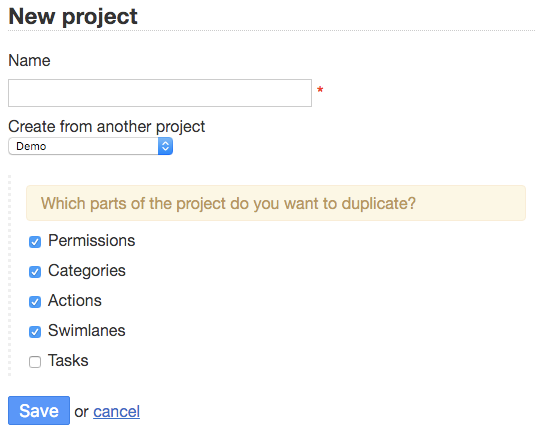 Kanboard can handle multiple projects. It’s very easy: you just have to find a name for your project! From the dashboard, click on the link New private project. Projects can be modified at any time. To rename a project, just click on the link entitled “Edit project” on the left. The start date and end date are used to generate the project Gantt chart. The description is visible as a tooltip on the board and on the projects listing page. Administrators and project administrators can convert a private project to a multiple-user project by changing the checkbox “Private project”. You can also convert a multiple-user project to a private project. Note: When you make a project private, all existing users will still have access to the project. You must adjust the list of users according to your needs. To remove a project, you must be the manager of the project or an administrator. Go to the “Project settings”, and from the menu on the left, at the bottom, choose “Remove”. Removing a project removes all tasks that belong to this project. Each project is isolated from other projects. Project access must be allowed by the project owner. Only administrators have access to everything. Private projects cannot define permissions. 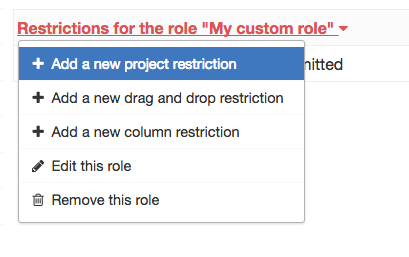 You can create custom project roles to apply a set of specific restrictions on the people that belong to this role. These custom roles are defined for each project. 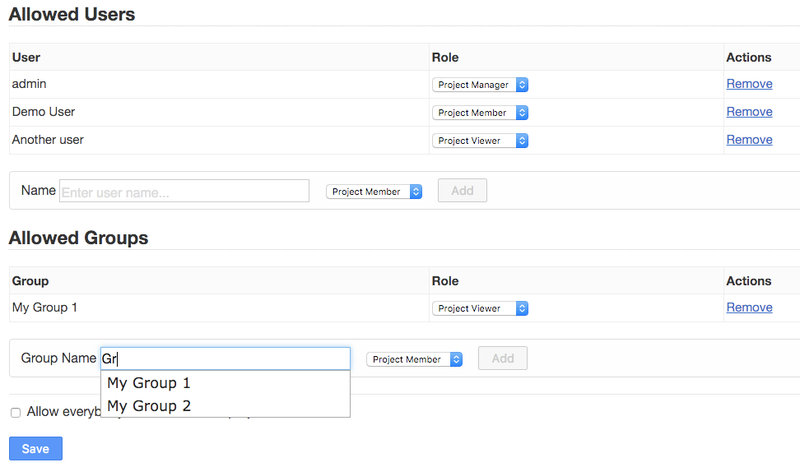 A custom role inherits from the project member role. For example, you may want to create a custom role to force someone to follow a process. You can have a group of people that are allowed to move tasks only from the column “Work in progress” to the column “Done”. From the project settings, click on the left on the menu Custom Roles and at the top of the page click on Add a new custom role. Give a name to the role and submit the form. For example, this role is able to create tasks only in the column “Backlog” and to move tasks between the column “Ready” and “Work in progress”. Go to the “permissions” section on the left menu and assign the desired role to the user. Users that belong to this role will be able to create new tasks only in the column “Backlog”. The combination of the 2 rules is important, otherwise that will not work. Users that belong to this role will be able to change the task status in the column “Backlog”. Tasks with the status open are visible on the board and tasks with the status closed is hidden by default on the board. Users that belong to this role won’t be able to change the task status in the column “Done”. However, it will be possible in other columns. Users that belong to this role will be able to move tasks only between the column “Ready” and “Work in progress”. By default, boards are private, but it’s possible to make a board public. A public board cannot be modified: it has read-only access. Access is protected by a random token. Only people who have the correct URL can see the board. Public boards are automatically refreshed every 60 seconds. Task details are also available in read-only mode. Select your project, then click on “Public access” and finally click on the button “Enable public access”. You can also disable public access whenever you want. Each time you enable or disable public access, a new random token is generated. The previous links will not work anymore! Custom filters allow you to save any search query. In this way, you can extend the default filters easily and save most used search queries. 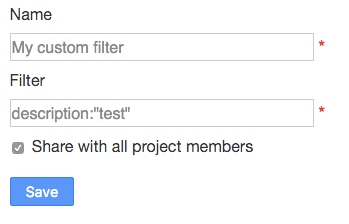 Custom filters are stored by project and associated to the creator. If the creator is project manager, he can choose to share the filter with other project members.